Spring time never fails to show off the beauty of nature, the wonder of re-birth, new birth, reviving mind and body with flowers, cute babies and warm weather. It’s the cute babies I want to focus on. For example this cute baby showed up at work the other day. A lady found it in her yard and she has really big, mean dogs and was obviously worried about it. So she scooped it up and called her friend at Farm Bureau insurance, who called my husband who told them to come see me since my mom is a licensed wildlife rehabilitation person. I just love small towns. So I call my mom but she isn’t home so I call another friend who is also a wildlife rehab lady, Dawn. 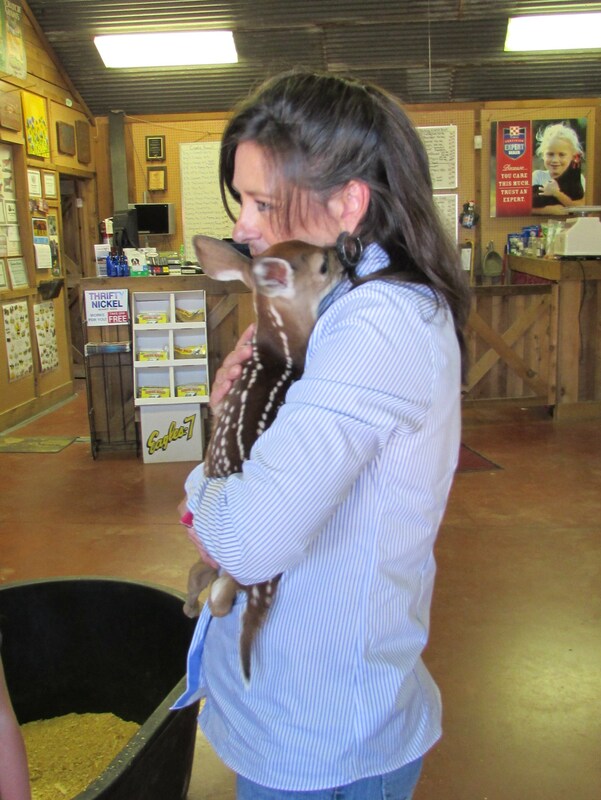 Dawn said she would be happy to take the fawn however it was going to be about 45 minutes. 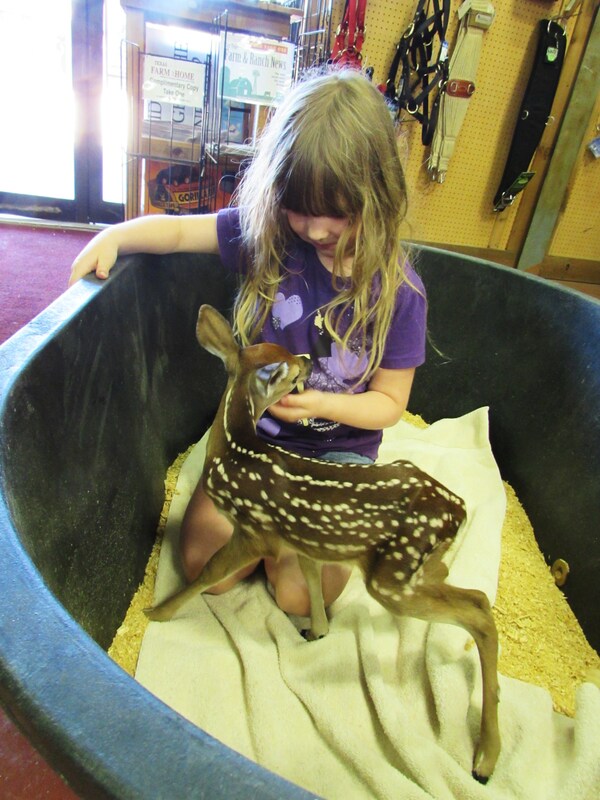 The lady who picked up the deer couldn’t wait so I kept it at the feed store. Addie was really pleased about this. It kept trying to go all over the place so I stuck it in a water trough with Addie for company, this pleased her even more. It kept trying to nurse her elbow and fingers much to Addie’s delight. 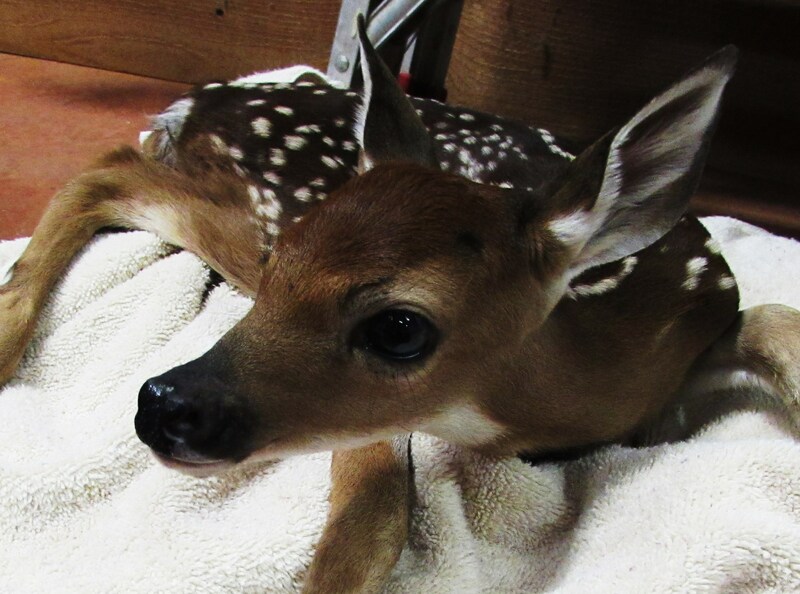 When Dawn arrived I was relieved, that baby buck doesn’t know how lucky he is! Anyway. If you happen to run across one of these in your daily wandering….. Please don’t touch it, don’t pick it up and for heaven’s sake don’t take it home! 9 times out of 10 the mother is lurking very nearby and baby snatching is not cool. But if you find one hurt or the mother missing beyond doubt please pick up the phone and call your Farm Bureau agent. Just kidding! 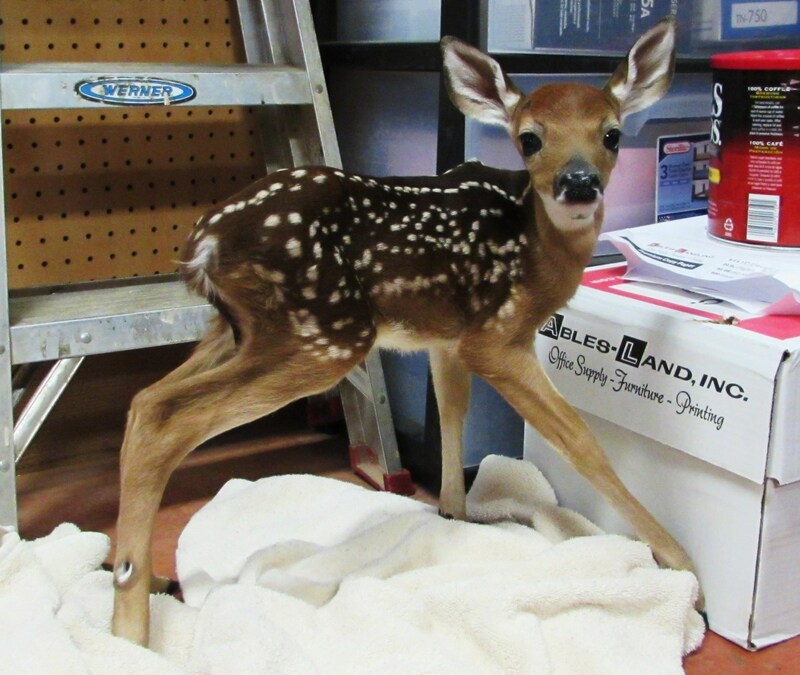 Call your state’s wildlife department who can help you find a rehab lady or gent in your neck of the woods. 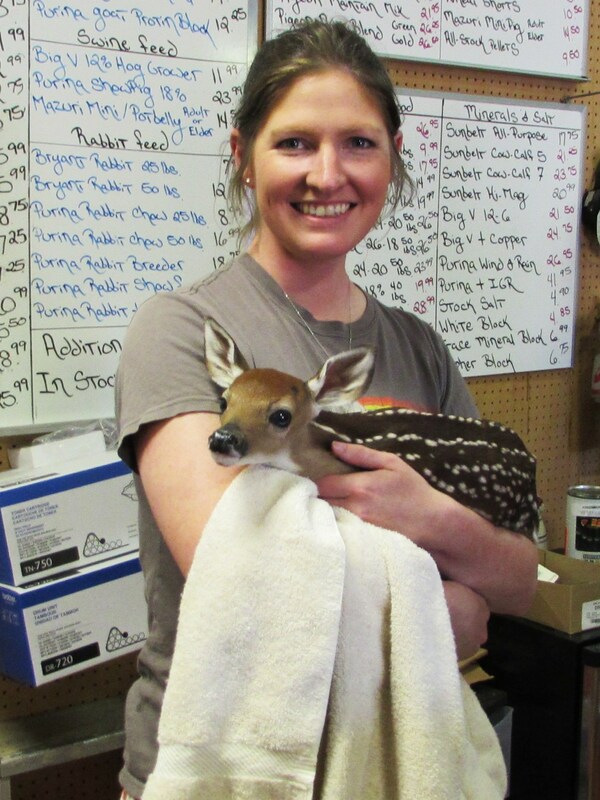 Baby deer require very special care to be healthy and wild enough to be released when they are older. So don’t keep it, give it a kiss, take a picture or 20 and let it go be a deer. It’s mother and I thank you in advance. Rachel, Wildlife Officer: “Sir, I’m going to have to ask you to put the deer back. No, seriously. 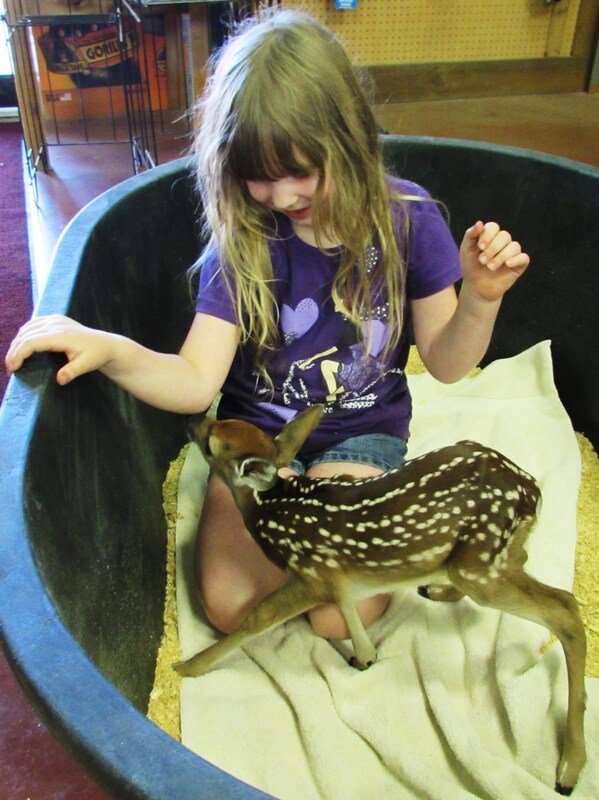 PUT THE DEER BACK.” Oh, if only people understood about baby wildlife…just like baby rabbits only feed about twice a day. It’s okay that mom isn’t a helicopter mom and sitting on top of them 24/7. Or baby birds…if they have wings, they have fledged. Give them a day or so, and they will likely be in the trees. Of course, a great many people have cats, and that’s usually why they bring them in. 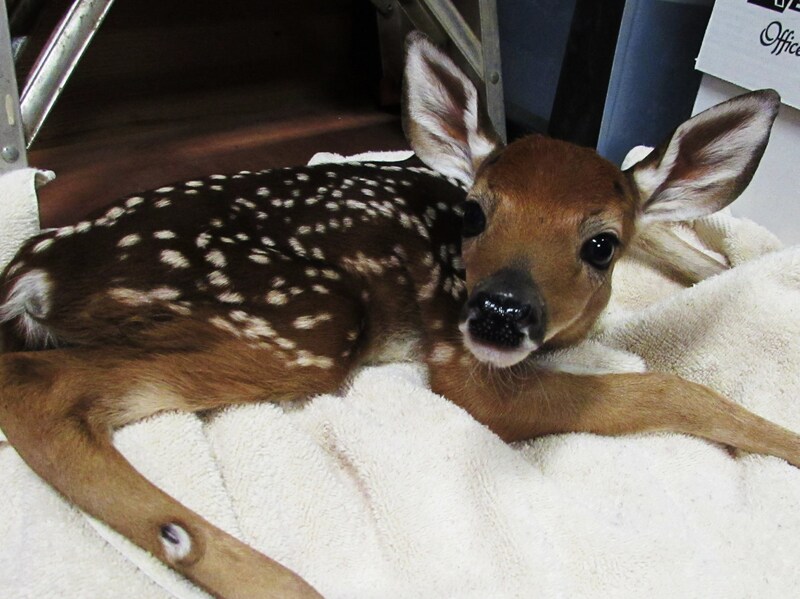 There is a reason I’m not a wildlife rehabber…I give them my respect!!! Talk about a 24/7 job.